I am having problems assembling the buds. Do you have a more detail showing how to do the step? Hi Nancy! Unfortunately this is the only photo tutorial we have for this project. If you send an email to hello@liagriffith.com with more detail about what you’re stuck on, we can help! I can’t find the PDF file for patter of Denrobium? Hello Lia, I love this project. I would like to add this to my blog as a great craft project my readers would love. Would it be okay to write a short description of the project, use one of your Pinterest images, and then link back to you for the full project? You can definitely do that Lynn! I love when other blogs share my projects! I only ask that you keep the liagriffith.com watermark on the bottom of the photo 🙂 Thank you so much for thinking to include me on your blog! where do I find the svg version of this flower? Would this project work with crepe paper instead? Yes, you can. Make sure to align the pattern with the grain though. So your points on your petals are vertical with the vertical grain. Does that make sense? How much do all the materials usually cost? And where would you suggest we get these supplies? 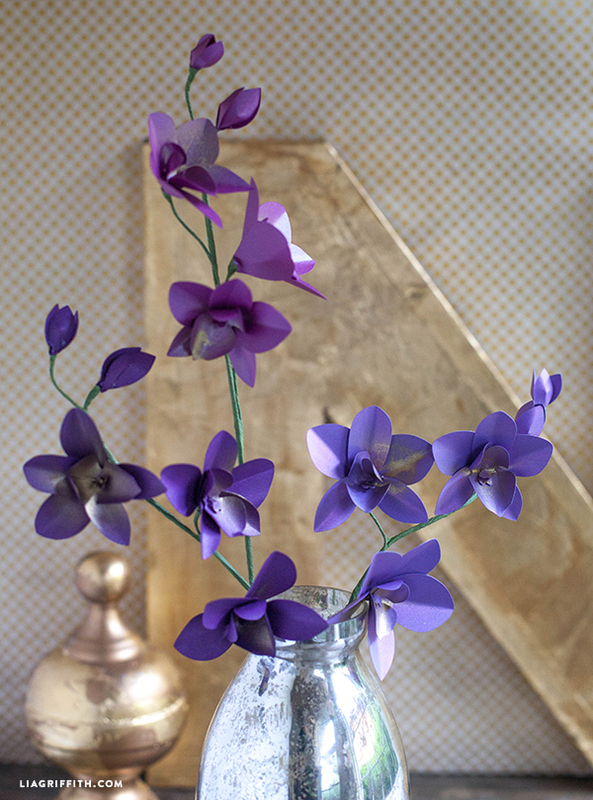 Your paper flowers are awesome to have as decorations around the house 😀 I’ve also given a bouquet of your paper roses as a christmas present and the recipient was delighted! I’m going to make these dendrobiums and have them around the house for a summer themed decoration as well! 😀 Your projects and templates are easy to follow and are astounding! More power to you Lia! Your comment made my day!!! Thank you so much! Hello I just got a silhouette camo tonight and was excited to upload this svg file to it but it wont let me. when i click on the download it goes to internet explore please help. 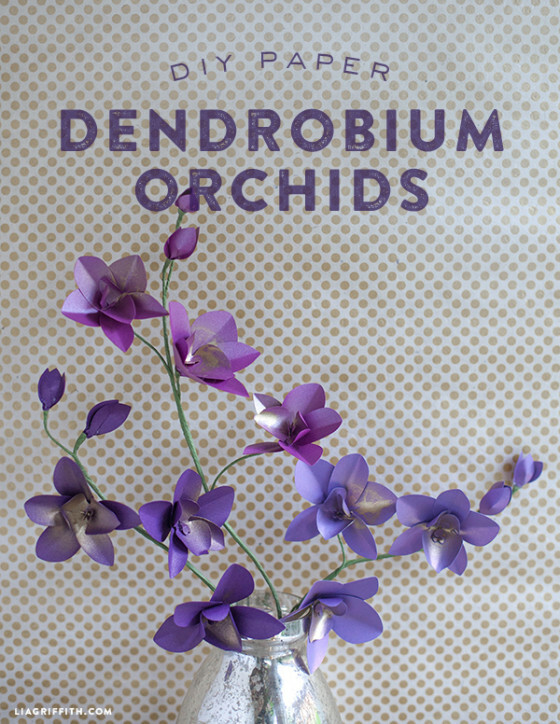 The file is hosted by Paper-Papers.com http://www.paper-papers.com/news/metallic-paper-dendrobium-orchids/ Have you looked in your download folder, since it is a large file it is saved as a zip and doesn’t pop-up on the screen. On my computer it shows all files downloaded at the bottom of my browser. I love these! My real orchids seem to always die! Did you rub gold stamp on them to make them look more natural? I know, mine too:) That is why I love this one. I added a gold spray paint, just be careful so you don’t add too much. Thank you for another great tutorial! I’ve been making paper flowers for my wedding and your hydrangeas are one of the varieties I’ve made, I’m super happy with how they’ve turned out. Although the wedding is only a few weeks away, these orchids look approachable enough that I’m very tempted to add them to the decor! Would you be able to give an estimate of how long it takes you to make it? I know it’s hard to say, since you are probably way faster than I would ever be, but a time guideline would be super helpful, sometimes I’m hesitant to take on one of your beautiful projects because it looks like it could take hours! Hello Grace! Congratulations on your upcoming wedding! So excited to hear that you have been making paper flowers for your wedding, we just did a paper flower wedding this weekend and it turned out absolutely beautiful. This Dendrobium Orchids is actually one of my “easier” one so I’d say to give it a try. Hope you have a great time at the wedding and congratulations again! I recently subscribed to your blog & email, and always look for your posts and open them first! You mesmerize me with your creative talent and I am looking forward to getting involved. Hi Jean, thanks for reaching out. Hearing that you open my blogposts first just made my day! 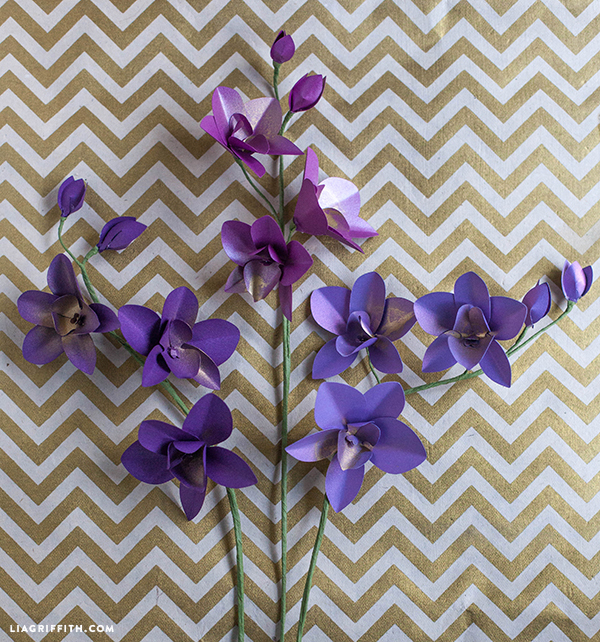 Other than the metallic paper, what other papers can we use to make these? Try any paper in text weight paper, card-stock is too heavy. How do you do it? 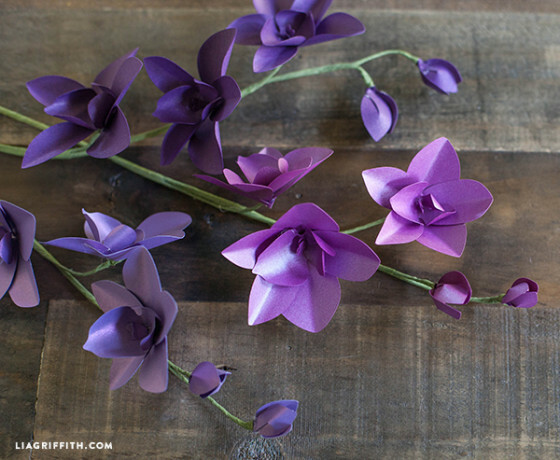 Another gorgeous flower to make!!! These are just fabulous! Thank you so much for always being so generous.